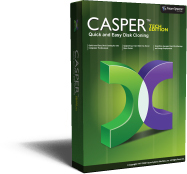 Designed especially for computer technicians, system integrators, and IT department use, Casper™ Tech Edition makes it faster and easier than ever to upgrade, replace, back up, restore, and re-image Windows™ system disks. Casper Tech Edition quickly clones all popular Windows configurations, making short work of hard disk upgrades and replacements on servers, desktops, and laptops. Automatic partition resizing and alignment ensure available space is maximized automatically when upgrading to larger hard disks and migration to smaller hard disks, solid state drives (SSD), and Advanced Format drives (AFD) is effortless. Provides complete support for GPT disk partitioning and UEFI systems. Casper Tech Edition provides complete support for creating, maintaining, and restoring disk image file backups that can be stored just about anywhere, including network attached storage devices and drives containing other data. Image files created in industry standard Microsoft Virtual Hard Disk (VHD/VHDX) format, which eliminates the need for proprietary software to mount, read, or update the contents. Exclusive SmartClone™ technology safely eliminates the redundant transfer of data during the imaging process, saving you valuable time by dramatically reducing the time required to update a full disk image, restore a disk image, or re-image a Windows system. A backup created by Casper Tech Edition can be used as an immediate and permanent replacement for a failed hard disk, restored to a new disk, or used to quickly re-image an existing disk. Clone a computer's Windows system disk to another disk to maintain an instantly bootable backup replacement for the computer. Should the computer's system disk fail or become corrupted, you can boot and run the computer directly from the backup disk and and be up and running again in seconds! Create a system disk image file backup and use it to quickly re-image the Windows system disk, restore a new disk, or perform a bare metal recovery when necessary. Use in combination with Microsoft's Sysprep utility to greatly simplify the process of manually replicating a hard disk image to a new computer system. Casper Tech Edition is uniquely designed to run directly from a USB flash drive or CD without installing any software, which means you can upgrade, replace, back up, restore, and re-image a Windows system without making any modifications to the system. Automatic Copy Verification technology sets a new standard for reliability by ensuring data is not corrupted during the imaging process by faulty RAM, a defective cable, failing disk, or bad controller interface. AccuClone™ disk imaging technology ensures a perfect image whether running natively from within Windows or from the Casper Tech Edition customized boot environment. SmartAlert™ notifies you automatically via email when the disk imaging process has been completed. Casper Tech Edition is licensed per technician rather than per computer so a single technician can use the software on multiple computers.